Though this functionality is only available on request at the moment, it will soon be available to all businesses in Australia. This is a huge win for the Brand Managers out there who continue fighting the never ending battle of Sales vs Awareness with their stores. Now they will have access to and control of the elusive Parent-Child page management functionality. 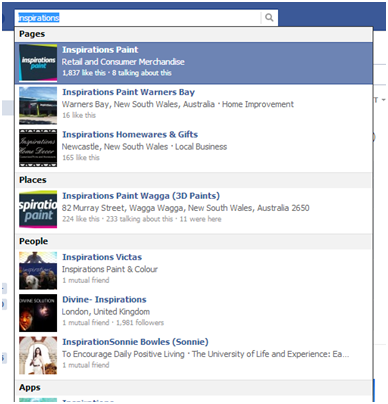 Essentially, businesses will be able to > > > claim all their pages under a parent / child relationship, accurately update page details and info where appropriate, identify and unauthorise duplicate pages for same locations, benchmark individual page performance and encourage customers to check-in, like and recommend local pages to their friends. Fingers crossed this will mean McDonald’s McCafe in Warners Bay will have to sharpen up their act and make a decent cup of coffee from now on. Oh yes, I forgot to mention. This move places some serious power into the hands of consumers. Think of all those complaints that are now going to be tagged to individual stores rather than organisations as a whole! Whilst this functionality is still currently in a Beta testing phase (with a select few businesses trialing it at the moment in the US including Toy’s ‘R’ Us, Subway and Lowes), it remains unavailable to the public as an internal development project. There are companies such as http://facebook-parent-child.room214.com/ offering to set up this functionality sooner than others but it can be quite costly depending on your budget. For the short term unfortunately, my Monday morning coffee that I should have got from somewhere other than Warners Bay McCafe will stay cold with no froth. This tool is expected to roll out to the public around August 2013 and you will need to submit a request to Facebook to implement these changes. Your brand will have to develop an Excel spreadsheet listing your locations, naming, store ID numbers, contact information, etc. It is not entirely manual just yet. Happy status Facebook updating thingy.